A very scarce Paden City #300 Archaic style ice tub with the famous Cupid etch. 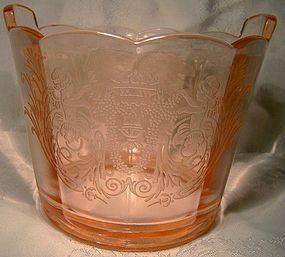 This pink Depression or Elegant glass item stands 4-1/4" high (excluding the 1/2" tab handles) and it is clean with the expected light wear to the bottom and a crisp and vivid etch. It is in excellent condition with no chips, cracks, losses, damage or repairs except for a tiny internal stress crack on the bottom rim. All items are thoroughly and conservatively graded and all condition issues are noted; all items are vintage or antique and may have slight signs of gentle use. Expedited tracked and insured parcel shipping to the U.S. starts at $24 (other spots may vary, air is higher). Items paid with a credit card will be shipped to confirmed addresses only. We do ship internationally. All of our prices are in $US. PLEASE NOTE: We DO NOT accept PayPal. 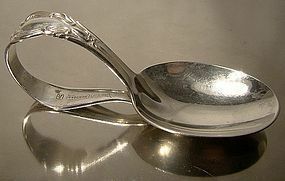 A well made vintage WMF (Wurttembergische Metallwarenfabrik Germany) .800 silver soup ladle in the Chippendale pattern. Chippendale has been manufactured by WMF since 1930. 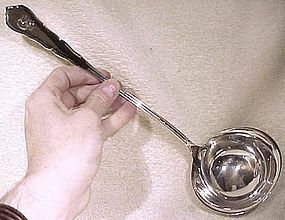 This ladle measures 12-1/2" long, 3-7/8" across the bowl, which has curved edges, and it weighs an impressive 6.4 ounces. 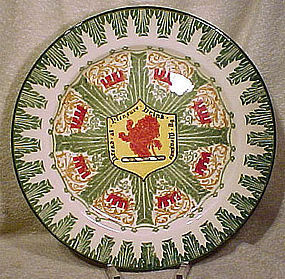 It is stamped WMF and 800, with the crescent moon and crown. It has an RD monogram, and it is in excellent vintage condition with no dents, corrosion, pattern wear, cracks, repairs or damage. All items are thoroughly and conservatively graded and all condition issues are noted; all items are vintage or antique and may have slight signs of gentle use. Expedited tracked and insured parcel shipping to the U.S. starts at $24 (other spots may vary, air is higher). Items paid with a credit card will be shipped to confirmed addresses only. We do ship internationally. All of our prices are in $US. PLEASE NOTE: We DO NOT accept PayPal. 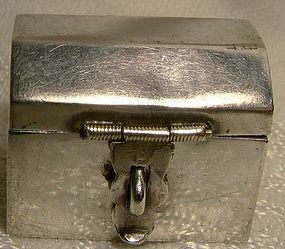 A really cool Mexican sterling silver pill box (or trinket box) c1980 in the form of a dome top trunk. This 1-1/8 x 7/8" vanity item has a hinged top and a working hinged hasp and loop. It is stamped with a Mexican silver mark and IC10 and it weighs 13.8 grams. It is in excellent condition with no dents, bends, corrosion, losses, damage or repairs except for a bit of minor flattening on the lid. All items are thoroughly and conservatively graded and all condition issues are noted; all items are vintage or antique and may have slight signs of gentle use. Small packet air shipping to the U.S. starts at $9.50 (other spots may vary). Items paid with a credit card will be shipped to confirmed addresses only. We do ship internationally. All of our prices are in $US. PLEASE NOTE: We DO NOT accept PayPal, only VISA and MASTERCARD. An attractive vintage Art Deco Czechoslovakian art pottery hand painted lustre basket by Ditmar Urbach c1920s. 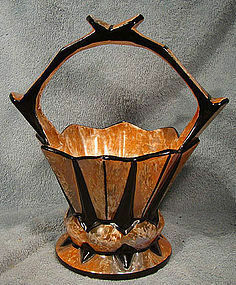 This 8" high decorative item features orange lustre with black highlights; it is stamped 10978 on the bottom. This item is in excellent original condition with no chips, cracks, crazing, losses, damage or repairs other than a 1/8" flake to the black paint on the basket's edge. All items are thoroughly and conservatively graded and all condition issues are noted; all items are vintage or antique and may have slight signs of gentle use. Small packet air shipping to the U.S. starts at $16.50 (other spots may vary). Items paid with a credit card will be shipped to confirmed addresses only. We do ship internationally. All of our prices are in $US. PLEASE NOTE: We DO NOT accept PayPal, only VISA and MASTERCARD. A 4-7/8" tall trumpet-shaped English art pottery vase by Ault. 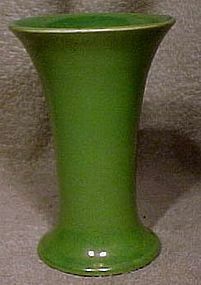 This vase has the stylized mark used by Ault from 1923-37; the colour is a light green with fine lustre hues. This item is in excellent original condition with no chips, cracks, losses, damage or repairs other than some allover crazing. All items are thoroughly and conservatively graded and all condition issues are noted; all items are vintage or antique and may have slight signs of gentle use. Small packet air shipping to the U.S. starts at $13.50 (other spots may vary). Items paid with a credit card will be shipped to confirmed addresses only. We do ship internationally. All of our prices are in $US. PLEASE NOTE: We DO NOT accept PayPal, only VISA and MASTERCARD. A vintage maroon velvet Bulova man's watch box with gilt mounts c1930s. This 4-7/8" x 3-1/4" box has a mount for a man's Bulova wristwatch, a velvet and shiny material liner, and a gold stamp saying BULOVA CANADA'S FINEST TIMEPIECES. It has a BULOVA name impressed into the front of the case (we're not sure if it has a metal nameplate or if it was impressed as it appears). The gilt brass feet retain their gilding, and this case is in very good original condition with no corrosion, losses, damage or repairs other than some minor fraying of the velvet at the mount, the tearing of the shiny material which links the top and bottom (still present), and some rubs to the nap on the upper edges of the outer case. All items are thoroughly and conservatively graded and all condition issues are noted; all items are vintage or antique and may have slight signs of gentle use. Small packet air shipping to the U.S. starts at $9.50 (other spots may vary). Items paid with a credit card will be shipped to confirmed addresses only. We do ship internationally. All of our prices are in $US. PLEASE NOTE: We DO NOT accept PayPal, only VISA and MASTERCARD. 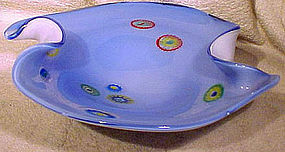 A Murano 1950s blue cased glass bowl with paperweight caning. This 11" x 9-1/8" bowl has nice light blue glass over white with cut paperweight style canes throughout; it has a great folded edge and it is unsigned. This item is in excellent original condition with no chips, cracks, losses, damage or repairs. All items are thoroughly and conservatively graded and all condition issues are noted; all items are vintage or antique and may have slight signs of gentle use. Expedited tracked and insured parcel shipping to the U.S. starts at $23 (other spots may vary, air is higher). Items paid with a credit card will be shipped to confirmed addresses only. We do ship internationally. All of our prices are in $US. PLEASE NOTE: We DO NOT accept PayPal. A pair of fine signed French crystal nut, candy or mint dishes by Daum. These serving bowls measure 3-1/2" across the tops and they stand 2-1/8" high. Each is acid stamped DAUM FRANCE, and this pair is in very good condition with no chips, cracks, losses, damage or repairs other than a fine patina of light scratches from use. All items are thoroughly and conservatively graded and all condition issues are noted; all items are vintage or antique and may have slight signs of gentle use. Small packet air shipping to the U.S. starts at $16.50 (other spots may vary). Items paid with a credit card will be shipped to confirmed addresses only. We do ship internationally. All of our prices are in $US. PLEASE NOTE: We DO NOT accept PayPal, only VISA and MASTERCARD. 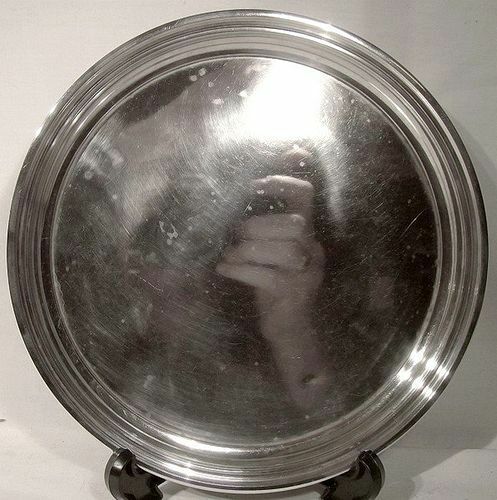 A Birks sterling silver footed round salver or serving tray with the Birks year mark for 1955. This quality 7-1/8" across vintage tray is stamped BIRKS STERLING 106/0. 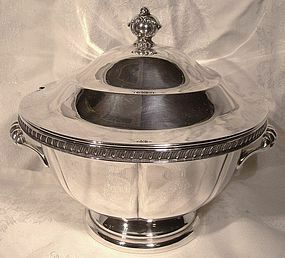 The salver sits slightly raised on feet. It weighs 167 grams, and it is in very good condition with no bends, corrosion, losses, damage or repairs other than some surface spotting and a small dent (the spots can be buffed out). All items are thoroughly and conservatively graded and all condition issues are noted; all items are vintage or antique and may have slight signs of gentle use. Expedited tracked and insured parcel shipping to the U.S. starts at $24 (other spots may vary, air is higher). Items paid with a credit card will be shipped to confirmed addresses only. We do ship internationally. All of our prices are in $US. PLEASE NOTE: We DO NOT accept PayPal, only VISA and MASTERCARD. 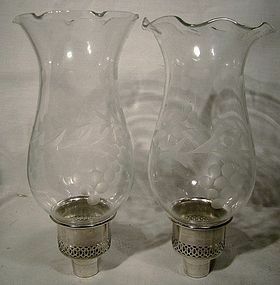 A fine vintage pair of decorative etched glass and sterling silver hurricane lamp inserts for your sterling (or silver plated) candlesticks. These 8-1/8" tall lighting accessories consist of the sterling pierced socket inserts (plugs tapering from 13/16 to 15/16") and the etched glass oil lamp style chimneys (and they should fit most 20th century candleholders). The inserts are stamped STERLING and this pair is in excellent condition with no chips, cracks, dents, bends, corrosion, losses, damage or repairs. All items are thoroughly and conservatively graded and all condition issues are noted; all items are vintage or antique and may have slight signs of gentle use. Tracked Packet shipping to the U.S. starts at $17.50 - this includes online tracking, air service and insurance up to $100. Items paid with a credit card will be shipped to confirmed addresses only. We do ship internationally. All of our prices are in $US. PLEASE NOTE: We DO NOT accept PayPal, only VISA and MASTERCARD. 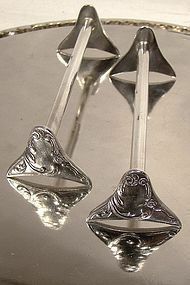 A Birks pastry lifter or tongs with sterling silver handles. 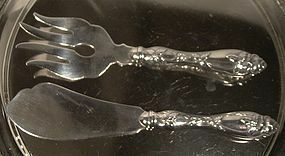 This 10-1/8" long pastry lifter or pastry tongs has hollow handles that are stamped BIRKS STERLING and the chrome plated scissors style blades are stamped GERMANY. This serving piece is in excellent condition with no dents, bends, corrosion, losses, damage or repairs. All items are thoroughly and conservatively graded and all condition issues are noted; all items are vintage or antique and may have slight signs of gentle use. Tracked packet insured air shipping to the U.S. starts at $16 (other spots may vary). Items paid with a credit card will be shipped to confirmed addresses only. We do ship internationally. All of our prices are in $US. PLEASE NOTE: We DO NOT accept PayPal, only VISA and MASTERCARD. 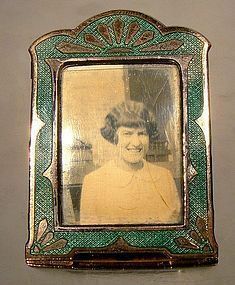 An Edwardian enamel miniature stand-up picture frame circa 1910 1920. This antique tiny picture frame measures 1-5/8" x 1-1/4" and features green baisse-taille enamel over copper. 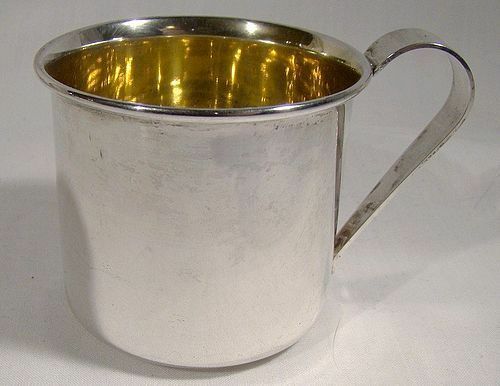 It has a support strut with traces of silver plating, so it most likely was silver plated originally. Likely Czechoslovakian in origin, but it is unsigned (Czechoslovakia was part of the Austro-Hungarian empire before 1919) It has a crackled instant relative photo under a celluloid window, but we will remove it if you prefer. It is in otherwise excellent condition with no chips, cracks, dents, bends, corrosion, losses, damage or repairs other than the loss of the silver plating and several cracks in the old yellowed celluloid window. All items are thoroughly and conservatively graded and all condition issues are noted; all items are vintage or antique and may have signs of use. Expedited tracked insured air post to the U.S. starts at $18 (other spots may vary). Items paid with a credit card will be shipped to confirmed addresses only. We do ship internationally. All of our prices are in $US. PLEASE NOTE: We DO NOT accept PayPal, only VISA and MASTERCARD. A high quality pair of ehat we believe are German 3-5/8" knife rests, and they are marked RADO 90. This fine pair is in excellent condition with no monograms, dents, bends, corrosion, losses, damage or repairs. All items are thoroughly and conservatively graded and all condition issues are noted; all items are vintage or antique and may have slight signs of gentle use. Small packet air shipping to the U.S. starts at $9.50 (other spots may vary). Items paid with a credit card will be shipped to confirmed addresses only. We do ship internationally. All of our prices are in $US. PLEASE NOTE: We DO NOT accept PayPal, only VISA and MASTERCARD.